Yes, it seems I actually did stick you into the end of the Second World War, and right into the victory celebrations. But I'm pretty sure all I need to do is find the right coordinates to repair the time machine. Amy? Amy? I insist you drag yourself away from this sailor right now and communicate with me! So, ya like, stick me here in 1940-sumthin' and you wanna wreck my fun right off the bat? Seriously? Listen to me, Amy. You think it's all fun and good times because thankfully you ended up being transported to the end of World War II - to May 7th, 1945. to be precise. But I think I should let you in on the reality of what people have been going through. I think you need some perspective. How about we look at 1944? My point of view is that it's necessary for you to have some idea of what's been going on prior to your arrival in 1945. In 1944, an average home costs approximately $3,500 in North America. The average salary of a home buyer is $2,300. Young men have left their homes and are fighting in Europe. People are lining up in England to receive their rations of food: sugar, coffee, tea and butter. Meats are also hard to come by. A bottle of pop is 5 cents. Ration Books are being used in Canada and the United States, allowing each person a specific amount of scarce food. During World War II, women are involved in crucial roles, both at home and in Europe. More than 350,000 U.S. women are serving in the Armed Forces, at home and abroad. Rosie the Riveter is an American icon, symbolized as a factory worker. In 1943, more than 300,000 women work in the aircraft industry in the United States. In Canada, approximately 50,000 women are enlisted in the Canadian Armed Forces. These jobs are mainly traditional female roles such as clerical positions and cooking. But others involve technical jobs to relieve the men from their jobs - they are needed in combat. With the continuing lack of manpower, women are increasingly being recruited to fill these positions. In 1939, this recruitment is focused on young single women, but by 1942, married women without children are targeted for full-time work. It won't be long before women with young children will be asked to work part-time, and this will gradually be changed to full-time. First used in a song in 1942, the term "Rosie the Riveter" is written by Redd Evans and John Jacob. 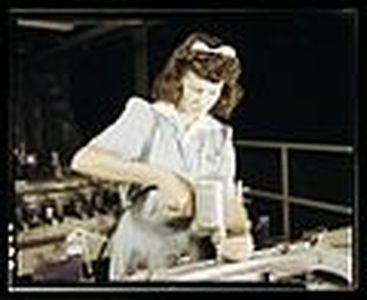 "Rosie" will become the most recognized representation of women entering the workforce during World War II. In the years preceding 1945, when you are currently stuck, "Rosie the Riveter" is inspiring a movement. Women are entering the workforce in unprecedented numbers, responding to what they view (with the help of "Rosie") their patriotic duty.